Grass trimmer, fits tractor's three-point linkage, for trimming grass along road verges, under railings and fences, etc. The machine is fitted with a spring-loaded trimmer disc for convenient trimming under fences and around other obstacles. The guard plate hits the post or other obstacle and springs back sideways out of the way and around the post\/obstacle to return to its starting position. The pressure exerted on the obstacle is easy to adjust in order to avoid causing damage. The machine operates with four thick trimmer wires, which are easy to replace. No tools are required for replacement of trimmer wires. The support wheel can be adjusted to different working heights. The trimmer unit's leading attachment on the three-point linkage, together with the support wheel, gives the machine good compliance with ground contours. Supplied with three-point linkage cat. 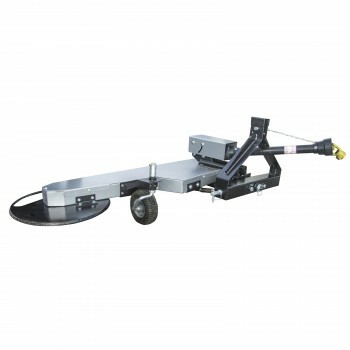 1, support wheel, PTO drive, oil for bevel gear and two sets of trimmer wires. The machine is fitted with a spring-loaded trimmer disc for convenient trimming under fences and around other obstacles. The guard plate hits the post or other obstacle and springs back sideways out of the way and around the post/obstacle to return to its starting position. The pressure exerted on the obstacle is easy to adjust in order to avoid causing damage.